at the sun sets on Tentuli, a village in Keonjhar district of Orissa, it is time to prepare for a long, sleepless night. As darkness descends, the male members of the village make sure that the children and women are tucked away in the safety of tree houses they have built. They then guard their dear ones from the wrath of elephants with drums and fire till the break of dawn. This has been a regular feature for the tribal people living in the villages of Keonjhar district of Orissa bordering Jharkhand. About 60 elephants are running amok in this region and have killed some half a dozen people and destroyed some 200 houses in the past few months. Life for the villagers seems to be hovering around the trees. 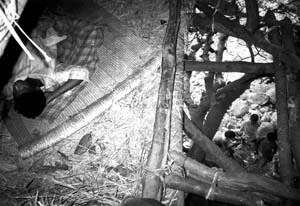 The frequent attacks of elephants has spread fear to such an extent that villagers cannot even think of stepping down from the trees during night. The normal life of villagers in nine blocks of the district has been paralysed. Of late, the incidents have not been confined to just human loss, they have aggravated the growing antagonism for government departments. Moreover, it has raised the vital issue of human rights versus animal rights. Says a terrified Kartika Naik of Tentuli village: "The police arrests us when we kill elephants. But what are they doing when elephants are on the rampage?" According to the Keonjhar forest divisional office, around 49 persons have lost their lives in last four years due to elephant attacks. Unofficial estimates, however, put the figure at 70. During 2000-2001, elephants destroyed crop area of around 45 hectares. However, no compensation has been given to the victims. What's the provocation? The divisional forest officer of Keonjhar, Vikram Singh, says that the elephants are drawn by the smell of handia , a local brew made of fermented rice, which is prepared by the villagers. Local people, however, have a different opinion. Says Dusmant Kumar Jena, a social activist and secretary of Setu, a non-governmental organisation ( ngo) : "In several cases, the country liquor is not the reason. The menace of elephants came to light only four years ago whereas the tribal people have been preparing it for many years." The main reason, according to him, is the reduced density of forests. Bhagirathi Mohanta, an advocate based in Keonjhar says that mining activities have led to the depletion of the green cover in Keonjhar over the years. Out of 8,303 square kilometre (sq km) geographical area, the forest area constitutes only 3396.92 sq km. "On paper, the reserved forest area has not changed in the last 10 years. However, the density of the forest is reducing at an alarming rate due to unchecked timber smuggling," admits Aswini Mohanty, the forest ranger of Keonjhar. He adds that the forest department has failed to check the sound pollution from the frequent blasting in the mines. The government, on its part, has encouraged the mushrooming of mines, by granting new leases, he adds. Frequent blasting near the reserved forest area disturbs the tranquillity of elephant habitation. More than 200 mines are reported to be operating in the district. According to unofficial estimates, the mining operations have eaten up to 30 per cent of the reserve forest. Moreover, about 50 odd perennial streams have also dried up in the district. Elephants trying to quench their thirst move towards villages in search of water. Mohanty says that forest fires have reduced tree cover, thereby, eating into the food supply for the elephants. He believes that shifting cultivation is also a major threat to elephant habitat, which according to the district soil conservation officer is being practiced in more than 16,187 hectares of the district. Over the years, the failure of the government to check elephant poaching has resulted in the disappearance of many herds in the district. According to a survey conducted by Keonjhar district forest office, the number of elephants in the district has reduced from 130 in 1995 to 75 in 1999. Animal activist Niladri Behari Mishra says that decreasing forest cover in the Serenda forest of Jharkhand is forcing the elephants to migrate to Keonjhar. The divisional forest office had sought assistance of elephant trainers from Kerala and Karnataka to drive out the elephants. But the plan had to be postponed due to lack of funds. Later the government launched a programme to relocate them in the nearby Simlipal Sanctuary, but achieved little success. The only solution the forest department has come up with is to insist on the cultivation of ginger, turmeric and jute in adjacent fields, which generate a repellent smell for the elephants, thus stopping them from entering the villages. Meanwhile, resentment is brewing among villagers over the government's inaction. Experts fear that the situation may lead to a repeat of the Nayagargh incident. In 1999, villagers in this district of Orissa killed three elephants by giving electric shock after suffering this menace for more than seven years. Unless the government takes corrective measures, there will be little sleep for the tribal people of Keonjhar.